Global & Disaster Medicine» Blog Archive » The Los Angeles County Department of Public Health warns against consuming local deer- antler tea due to botulism risk. The Los Angeles County Department of Public Health warns against consuming local deer- antler tea due to botulism risk. LOS ANGELES – The Los Angeles County Department of Public Health (Public Health) warns against consuming local deer- antler tea due to botulism risk. Public Health has recently identified one confirmed and one suspected case of botulism occurring in adults. Preliminary investigation suggests that these cases may be associated with the consumption of a deer-antler tea product (photos attached) that was acquired during the month of March. 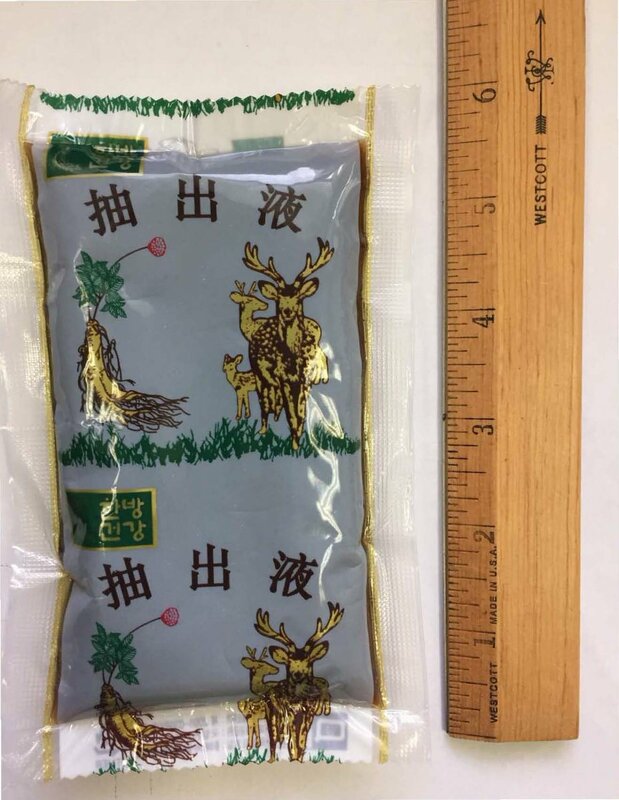 Pending further investigation, Public Health recommends that all persons who purchased product similar to this (i.e., deer-antler tea provided in a sealed pouch similar to the attached photographs) during the month of March, immediately dispose of it.Public Health will provide more information as it becomes available. Botulism is a rare but serious illness caused by a nerve toxin that is produced by the bacterium Clostridium. Classic symptoms of botulism include double vision, blurred vision, drooping eyelids, slurred speech, difficulty swallowing and weakness. These are all symptoms of muscle paralysis caused by the bacterial toxin. If untreated, these symptoms may progress to cause paralysis of the respiratory muscles, arms, legs, and trunk. In foodborne botulism, symptoms generally begin 18 to 36 hours after eating a contaminated food, but they can occur as early as 6 hours or as late as 10 days. The respiratory failure and paralysis that occur with severe botulism may require a patient to be on a breathing machine (ventilator) for weeks or months, plus intensive medical and nursing care. The paralysis slowly improves. People experiencing symptoms of botulism, who have recently drunk the tea, should seek immediate medical attention. The Los Angeles County Department of Public Health is committed to protecting and improving the health of over 10 million residents of Los Angeles County. Through a variety of programs, community partnerships and services, Public Health oversees environmental health, disease control, and community and family health. Nationally accredited by the Public Health Accreditation Board, the Los Angeles County Department of Public Health comprises nearly 4,000 employees and has an annual budget exceeding $900 million. To learn more about Los Angeles County Public Health, visit PublicHealth.LACounty.gov, and follow LA County Public Health on social media at twitter.com/LAPublicHealth, facebook.com/LAPublicHealth, and youtube.com/LAPublicHealth. This entry was posted on Sunday, April 30th, 2017 at 9:02 pm and is filed under Botulism .